Finnish trade unions have launched a national one-day strike protesting against austerity measures. 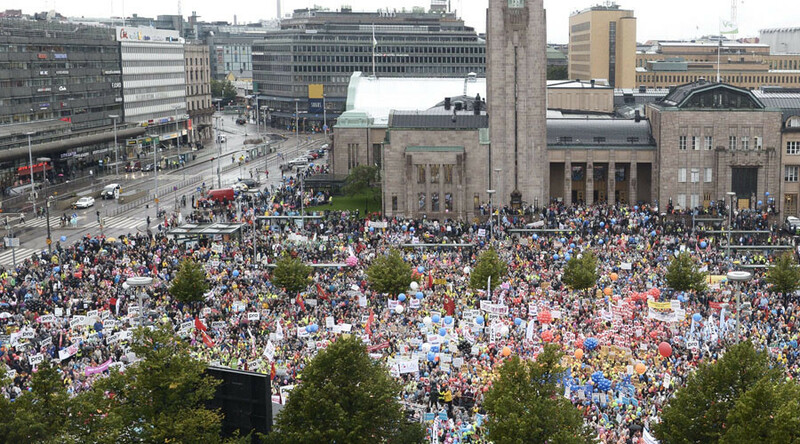 Some 30,000 people have taken to the streets of Helsinki rallying against the government’s plans to aid the economy at the expense of workers. The protesters are angry with the government’s plans to boost the competitive advantage of the Finnish economy by 5 percent in 3 years by cutting payments and compensation to working people. Finland’s three largest trade unions: Akava, SAK and SKKT have organized their 2.2 million members to strike in protest against the government’s reduction in expenditure plans at national level. Finnish media has stressed that the grandeur of the event is unprecedented in nearly 100 years. The last time anything similar was witnessed in the capital was in 1917, when Finland gained independence from Russia. Last week, the Finnish cabinet announced plans to cut holidays to state employees by 8 days (to 30 days), to cut pay for working holidays, as well as other payments and compensations. The strike began early on Friday morning and is set to last one working day. All railroad and bus lines, as well as servicing of aircrafts at the airports have been halted for 12 hours. “The strike is going on not only at Helsinki’s landside area. All of the country is on strike. This must become a strong message to the government,” Paavo Arhinmaki, a Finnish MP from the Left Alliance, told TASS. Although government representatives have attended and addressed the meeting in Helsinki, the leaders of the three ruling parties have not shown up, the organizers of the meeting noted. Big demonstrations on labour market reforms in Helsinki today. Public transport, among others, at a standstill. Finland’s government personnel, transport workers, industrial workers at metal and wood-processing industries, even post offices and a part of police officers have walked out for one day. Finland’s national air carrier Finnair has canceled 16 domestic flights, with more delays to be expected, according to airport authorities. Still, ferries, including international ones connecting Finland to Sweden and Estonia, are operating as usual. It is expected that some shops are going to be closed during demonstrations throughout the day in Helsinki and major cities. The government’s unilateral plans are apparently motivated by the failure of the players of the labor market to reach a collective agreement over the past year. The downturn in the Finnish economy has been going on for the last three years. Prime Minister Juha Sipila tweeted on Friday that trade unions and employers would be given time until September 30 to come forward with their proposals towards a collective agreement.